The FIFA World Cup has kicked off in Russia with its traditional fervor,. However, behind this whole fuss, capitalists are extracting enormous profits from the “fans”. If we look at the figures released by FIFA for World cup 2014; it made $2.4 billion in TV rights fees, $1.6 billion in sponsorships, and $527 million in ticket sales. Now according to Bloomberg, the 2018 World Cup is expected to rake in about $6 billion in revenue for FIFA, up 25 percent from 2014. With as many as 3.2 billion people expected to watch the tournament, broadcast revenue is expected to rise to $3 billion. Similarly, big brands in global sports industry such as Nike & Adidas alone reported more than 60 billion dollars sales in 2017. Let alone the country hosting the event, state officials in Russia claim the World Cup will add between $26 billion - $31 billion to the national economy. From these figures, one can judge that FIFA world cup is the most lucrative and costliest soccer event. It was not a surprise when Russian Ambassador to Pakistan Alexey Dedov confirmed that his country will be using footballs manufactured in the Pakistani city of Sialkot for use in matches of the 2018 FIFA World Cup. 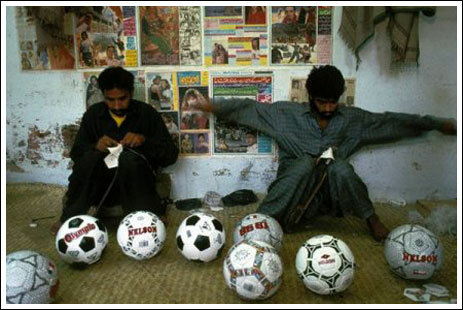 Around the world, more than 70% of the world’s footballs are made in the city of Sialkot in Pakistan. The Sialkot city has been exporting around 65 million balls per annum. In ruling elite; it’s being considered as a proud moment and they always express their enjoyment over this fact. Despite the “hallmark of quality” or “exceptional product” the reality exists in the brutal exploitation of the local working class. In western markets official World Cup Football will retail for as much as $150, however, workers which are real craftsmen who put life into dead material are marginalized and the worst victims of exploitation. The German weekly Spiegel reported that many suppliers of intermediary companies paid workers every single ball sewn about 50 cents each. That’s far below the minimum wage standard of the country. The football industry is more labor intensive where the stitching is still being done by human labour. In the supply chain, much of this labour intensive part is still done in informal settings such as stitching centers and home-based work. The rest of the process, including lamination, cutting panels, screen printing, quality control and packing, is completed by factory workers. The big names in Sialkot industry still prefer their intermediaries to get this work done. Due to the low level of skills involved in stitching, it is very easy to for children to get involved. Locally it’s often said that little figures of children are more effective for stitching. There has been much hue and cry on the elimination of child labour from industry, but according to the International Labor Rights Forum, it still persists. In its report, ILRF admitted that, “Unfortunately, the past decade’s efforts have not resulted in the eradication of child labor in soccer ball stitching though it appears to have decreased in Sialkot, Pakistan.” It further states that Child labour still exists in outsourcing. In informal settings often children can be seen working. Owing to the structure of industry much of labour is scattered in villages hence these workers effectively serve as raw material for exploitation. High unemployment rate and escalating living costs make it easy for capitalists to dictate their own terms. The concept of permanent or regular jobs is being diminished and it has been replaced by contract labour and temporary work. These workers are mostly on the mercy of their contractors and always work in unstable employment, lower wages and more dangerous working conditions. Social security and other social benefits are seldom and labour rights are only on papers. According to different statistics; it’s estimated that around 300,000 people directly or indirectly are attached to this industry. These workers don’t have right to unionize, and they can’t complain about their conditions to labour courts. The law of Pakistan doesn’t accept them as a formal worker. Even if these workers have some rights; they are too scared to organize because they know that they are easily replaceable. Despite efforts undertaken by government, advocacy groups, and industry members alike, child labor still exists in the soccer ball industry where the stitching is outsourced to home-based work. In addition, other issues, such as the use of casual or temporary labor, low wages, overtime and hazardous working environments persist. The condition of factory workers is not much different than their counterparts. In factories, workers are being hired through contractors. In past, a Sialkot worker was considered to be a privileged one. Due to their struggle and upsurge in capitalism; capitalists gave them many concessions. These were in the form of 8-hour days, paid leave, bonuses and free transport facilities. But in crisis capitalist have shown their true colors, now austerity measures are being imposed. In factories, the concept of permanent labour has become a dream. Even in factories, there are continuous attacks on workers. Unions are being crushed and there is an undeclared ban imposed on the registration of new unions. Instead of monthly wages or benefits; piece rate wage is common practice. Although it is said that worker is being paid on per piece rate, there are also many kinds of deductions to be made by contractors in the form of wastage, wrong stitches etc. Due to the hazardous working environment and long hours of work – workers are also posed to serious health risks. In stitching; due to a long hour working in the same posture; serious joints & orthopedic concerns have been found. In lamination; workers suffer from lung problems and the average age of workers is being decreased day by day. Despite this horrific situation, workers are determined to change their destiny. In recent years we have seen major upsurges in the Sialkot industry. Such marvelous examples are strikes of Forward Gear & Leather fields when workers won concessions for them. Similarly, in different factories spontaneous protests have become a norm. Recently CEO of Forward Sports Khawaja Masood while talking with Aljazeera TV said, “his company is a contracting manufacturer of global sports apparel giant Adidas, for whom it is currently working on a large order for the World Cup.” This is the same factory owner which has prepared a list of 600 workers to be laid off due to loss. Now due to CPEC, capitalists are preparing another major attack on workers. The so-called Export Processing Zones or Free Economic Zones are being developed in Sialkot city. In these EPZ even Pakistani fragile labour laws don’t apply, workers don’t have even right to raise his voice and go on strike. Pakistan Trade Union Defence Campaign PTUDC is leading battles of workers in sports industry of Sialkot. Our fight is not just with local capitalists but with global capital, as in the past, the so-called human rights champions European Union have been exposed. During 3 days strike of Forward workers; not only Adidas group but local EU officials rushed to crush the movement. Although at present workers movements are in embryonic form, the crisis of capitalism is unleashing new attacks on them. Workers are also preparing to defy all their attacks. We appeal to world workers and progressive forces to be a part of this fight to eradicate capitalism from the surface of the earth.